If you haven't yet tried quinoa, you will not be disappointed. Cooking quinoa is simple and fun! Just because it is so good for you does not mean that it does not also taste great! This false cereal (pseudocereal) is loaded with a high amount of proteins, accounting to about 12 - 18 percent of the total weight. Besides protein, it is rich in dietary fiber, magnesium, iron and phosphorus. Another quinoa nutrition fact is its gluten free nature, which make it an excellent grain for people having gluten indigestion problems. After cooking, it tastes mild with a slight nutty flavor. Overall, quinoa is a good protein source for pure vegetarians. Here, we shall take a look at making quinoa breakfast recipes in different ways. Quinoa can be used in a wide variety of recipes – from simple to gourmet. You can find a quinoa recipe to please anyone – even my picky preschooler's love to eat it! Regardless of whether you are a die hard vegan or a meat lover, quinoa is a great addition to your diet. In fact, some health experts believe that it is the most perfect plant based protein that exists on the planet! Before getting started cooking, one thing that you must remember is that it needs to be rinsed prior to cooking. The outside of quinoa is covered in a bitter substance called saponin. Not only is it very bitter to the taste but it can also cause digestive upset. If you are someone who has a very sensitive stomach, some health experts recommend soaking quinoa prior to rinsing. Soaking for 8 hours helps remove the phytic acid, which some believe causes problems with digestion. Personally, I sometimes soak before cooking, but most of the time I don't. I've never had an upset stomach from eating quinoa. If you do decide to soak, keep a close eye on it as it cooks. The seeds will be softer and it will not take as long to cook. Most recipes call for a 1 to 2 ratio between quinoa and liquid. I prefer to use 1 to 1.25 as the ratio. So, for a cup of quinoa you will want to have 1 1/4 cups of liquid. Bring it to a simmer and then reduce to low. Cover and cook 30 minutes. Remove from heat and allow to sit covered for another 5 minutes. Wash the quinoa with water and place it inside a small pan. Add two cups of water into the pan and heat it over the flame along with a bit of salt. Cook the quinoa for around 10 to 15 minutes until all the water is absorbed. Transfer the cooked quinoa in a medium-sized platter. In another frying pan, heat 1 tablespoon of olive oil and add the chopped zucchini and chopped bell pepper and saute them for about 5 minutes. Add salt and pepper and cook them until they are tender and soft. Add this cooked zucchini and bell pepper to the quinoa and mix them thoroughly. Now add the rest of the olive oil along with the chopped parsley, lemon juice and pepper. Mix everything together with a fork and adjust seasoning if needed. This is the best vegan quinoa salad recipe as it does not call for too many ingredients and it can be made in very quickly. In a saucepan, heat the chicken stock and add the quinoa grains into it. Cover with a lid and simmer at a low heat until all the stock is absorbed and the quinoa is tender and translucent. Remove from heat and keep it aside. In a small frying pan, heat a tablespoon of olive oil and fry the tofu cubes until it is golden brown in color. Remove from heat and let it cool. Fry the lima beans in a bit of oil and add it to the quinoa. In a small bowl, mix two tablespoons of olive oil, mustard paste, salt, minced garlic, lemon juice, sugar, lemon zest, freshly ground black pepper and chopped basil. Whisk all these ingredients together until they are well combined. Pour this mixture over the quinoa and also add the fried tofu. Stir the mixture well and serve it in a platter. This is the best quinoa salad recipe as it has a complexity of flavor and texture and the addition of lima beans increases the nutrition quotient. Wash the quinoa in running water and put inside a saucepan with water. Cover the saucepan with a lid and cook the quinoa on a low heat until the water is absorbed and the quinoa has fluffed up. Take a small bowl and add the tahini paste, olive oil, sea salt, crushed garlic, lemon zest and juice. Whisk it together until it is all well combined and add a bit of water if the mixture is too thick. Now toss the quinoa with the chopped red onion, chopped coriander and the beans. Pour the tahini dressing and mix everything well. Add more salt if required and garnish with a sprig of coriander. So these were some quinoa salad recipes that you can easily make at home and serve it to your family and friends. 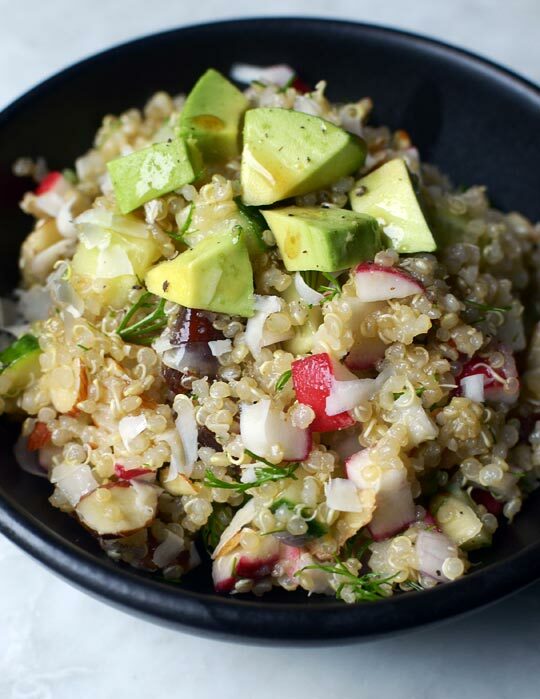 Quinoa salad is healthy and nutritious and they taste delicious as well. Prepare quinoa by soaking and rinsing for 2 - 3 times. Add it in a saucepan and add water. Cook it at high heat and bring to boil. Reduce heat, cover lid and simmer for 5 minutes. Stir in apples, seedless raisins and cinnamon. Simmer for another 10 minutes or until water is absorbed completely. Serve this quinoa breakfast recipe with milk and honey. In a saucepan, boil broth at a high heat and add quinoa. Stir well and reduce heat to medium low. Cook for 20 minutes and keep aside while keeping it covered. Take a mixing bowl and combine together carrot stripes, cabbage, pepper and lettuce. To this, stir and add cooked quinoa. Then, add garlic sprouts and olive oil. In a large sauce pan, pour milk and water, and then add rinsed quinoa. Keep it over high heat and bring to a boiling temperature. Reduce heat to medium low and simmer for 15 minutes with the lids on. By this time, the grains will absorb the liquid mixture and turn soft. While retaining the lid, remove saucepan from heat and allow to settle down for 5 minutes. Stir in blackberries and cinnamon to the cooked quinoa. With a spoon, transfer it in serving bowls. Serve quinoa breakfast recipe after topping with chopped pecans and a teaspoon of agave nectar. Thus, we have seen making easy quinoa breakfast recipes is more or less similar to that of rice recipes. Whether to make sweet or spicy quinoa is up to you. You can even try making your own recipe by adding different fruits, fish and meat pieces. In all recipes, one thing is for sure, you are serving a wholesome food loaded with nutrients to your family members. In a bowl, whisk the 2 types of flour, the quinoa flakes, starch, soda, salt, gum and cinnamon. In a separate large bowl, beat the eggs, oil, sugar, molasses, extract and orange juice. Mix together the contents of both the bowls and beat well. To this mixture, add the carrots, coconut and raisins, stirring well with the addition of each ingredient. Preheat the oven to 350 degrees F. In a 10x13 inch baking pan, place greased foil or parchment. Leave the cake batter to rest. Pour the cake batter into the baking pan. Make sure the batter is spread uniformly in the pan. Bake for 25-35 minutes. Check if cake is ready, by inserting toothpick into cake center. The center should be quite firm to touch, not gooey or sticky. Leave cake to cool, then cut into 15 pieces and wrap in foil. Store them in a bag and refrigerate for later use. Preheat the oven to 350 degrees F. Use a 9 inch square pan for baking and grease or line it with parchment. Mix the apple, agave nectar, oil, flax or chia seeds, quinoa, vinegar, vanilla, sunflower seeds and raisins in a bowl. Keep aside. In another bowl, sift the oat flour, baking powder and soda, ginger, cinnamon, salt and cardamom. Add oats to this bowl and mix well. Add the contents of the wet mixture bowl into the first bowl and stir well. A thick batter should be formed. Preheat the oven to 350 degrees F. Grease a baking pan or loaf pan. In a bowl, mix flax seed and warm water, keep aside. In another bowl, mix the quinoa flour, arrowroot, hazelnut meal, rice bran, cinnamon, baking soda and powder, salt and cloves. In a different bowl, mix the maple syrup, oil, flax-water mix and applesauce. Add the apple pieces to the quinoa flour mixture (dry mixture) and stir. Then add the maple syrup mixture to this bowl and stir well. A batter with apple chunks is formed. Pour batter into pan and spread evenly. Bake cake for 55 minutes to 1 hour. Allow cake to cool before slicing. Quinoa lends a unique and flavorful taste to food, with a granular texture. It has a very high protein content, especially among vegetables and fruits. Such nutritional qualities make quinoa an ideal protein source over meat and a useful substitute for wheat and rice in different foods. So next time, for a sweet yet healthy breakfasting food, try out the above quinoa breakfast cake recipes to whip up a delicious, fragrant and nutritious cake!